Delivered new through "Maranello Concessionaires Ltd." and registered in January, 1980 in Metallic Blue with Cream leather to Mr. A. N. P. of London. 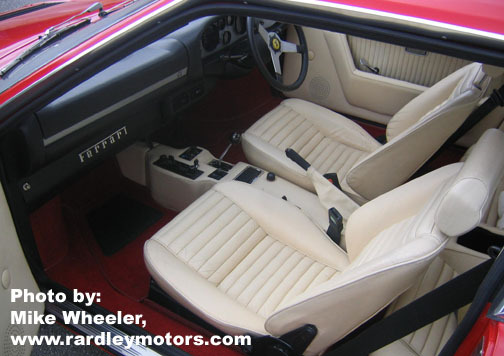 Second owner/keeper was "Southern Mechanical Handling" of Southhall in March, 1982 (In the Ferrari Owner's Club register, a Mr. B. S. is listed as the owner). 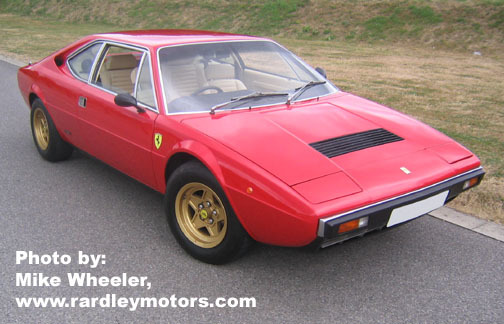 The next owner (although he never registered the car) was Mr. B. W. of Surrey, purchased through "Modena Engineering Ltd.", Surrey. The next owner was Mr. K. K. who purchased the car from Mr. B. W. in February, 1984. In 1986, Mr. K. K. commissioned "Moto-Technique" to repaint the car to red and also to replace the carpets for red ones. The wheels were also replaced with gold ones at this time too. In 2002, he had the engine rebuilt after a cam belt slipped. In July 2006, the car was purchased by Mr. C. R. (who plans to have the car prepared for racing in the Ferrari UK Historic Challenge).